DID YOU find all the different types of light in the PUZZLE? OK, but what's different about these light types besides just their names? While the atmosphere protects us from harmful radiation, it also limits the amount of information reaching astronomers. As you go through the information below, see if you can figure out which light types have trouble getting through the Earth's atmosphere. How Large are Radio Waves? 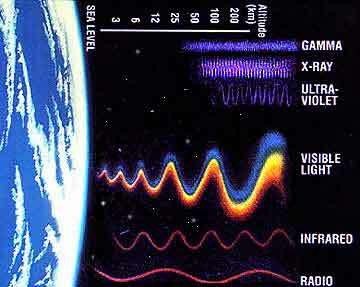 Of all types of light, radio waves have the longest wavelengths. Radio waves are longer than 1 mm and can be very long. In fact, the most common radio emission in the galaxy is at 21 cm, (about the length of the average forearm). This radiation is produced by hydrogen atoms. Astronomers use the 21 cm radio radiation to probe the gas and dust located between stars. Good Sources of Radio Waves: Hydrogen atoms, like we mentioned, are good sources of radio waves. Other sources of radio emission are from stars like our Sun. Distant galaxies or quasars (luminous objects at the center of some galaxies) can also be bright radio sources. Radio telescopes have to be large in order to capture these long waves. Scientists and engineers sometimes build several dishes that they hook up together to capture or record radio waves with more detail than single dishes can provide. These are called "arrays." The Very Large Array located in Socorro, New Mexico is one of the world's premiere astronomical radio observatories. The VLA consists of 27 antennas arranged in a huge Y pattern up to 36km (22 miles) across -- roughly one and a half times the size of Washington, D.C.
Sources of Microwaves: The universe is glowing in microwaves. Microwaves are the leftover radiation from when the Universe was once very hot after it formed in the big bang. What Causes Infrared? A lot of the infrared radiation we detect in the Universe is caused by dust. Dust particles are heated by higher energy radiation (like visible and ultraviolet light) and then re-emit the heat as infrared light. Good Places to Find Infrared Sources: Infrared images show the distribution of heat. All warm objects give off infrared. Infrared light emission is found in regions of space where large amounts of gas and dust are condensing to form new stars, so called "stellar nurseries." Infrared is absorbed almost completely in the lower layers of the Earth's atmosphere. For this reason, infrared astronomy has to be conducted from the highest mountain tops or airplanes. Unlike visible light, infrared shows through dust clouds in our Galaxy. So objects like the center of our galaxy, which we can't see in visible light because dust clouds are in the way, can be "seen" by looking at the infrared light given off. What Your Eyes See:The human eye only sees visible light. Sometimes scientists call this the optical range of light. This has been the most studied wavelength. Astronomers will often work in the "blue end" if they are interested in slightly hotter stars or the "red end" for cooler ones. What are Good Sources of Visible Light? When a star ages, its outer envelope can expand to 50 times its normal size. When it expands, it cools and looks red. It is then called a "red-giant" star. You can see that stars have different colors by looking at the constellation Orion this Fall. The star to the north is the red-giant Betelgeuse, compare how it looks to the star in the lower right corner of Orion, which is Rigel a hotter younger star. Other objects frequently observed in visible light are the Moon, solar system objects (Mars, Venus, our Sun, etc. ), stars, and other galaxies. Keck Observatory atop Mauna Kea on the Big Island of Hawaii. The Keck Telescope is eight stories tall and 300 tons in weight. Good Sources of UV: Ultraviolet radiation comes from hotter objects, including bright young stars, white dwarfs, and binary stars, which are two stars orbiting around one another. Ultraviolet astronomy has been used to show that practically all stars, including even some white dwarfs (stars at the end of their lives), lose matter in the form of stellar winds. Ultraviolet light has a difficult time getting through the Earth's atmosphere, so much of ultraviolet astronomy is done from satellites. Good Sources of EUV: EUV tends to come from objects that are really hot. For instance, white dwarf stars, which are typically ten of thousands of degrees hot, or the outer envelope of stars, typically hundreds of thousands of degrees hot, produce EUV light. White dwarfs are stars near the end of their lives. Once the nuclear energy production has stopped, gravity can squeeze a star the size of our Sun down to the size of the Earth. The "burnt-out" Earth-sized star then cools for millions of years like a brick out of an oven. Like most ultraviolet light, extreme ultraviolet light does not go through the Earth's atmosphere, so much of extreme ultraviolet astronomy is done from satellites. One such satellite is our own Extreme Ultraviolet Explorer satellite. What Causes X-Rays? X-rays are produced by very energetic events such as the falling of material ("accretion") onto the surface of a compact object (black hole, white dwarf star or neutron star). A neutron star is a dead star in which gravity has squeezed all of the matter into the size of a small city. One tablespoon of a neutron star would weigh as much as the entire human race. A black-hole is the extreme case of a compact object, where gravity is so strong not even light can escape from its surface. When a neutron star and an ordinary star are in a binary system (rotating around one another), material falling from the normal star onto the neutron star is heated to millions of degrees and emits X-rays; similar to a rock rolling down a hill and releasing its energy when it hits the bottom (but much more energetic!). X-rays also come from acceleration of particles in outer parts of a star's atmosphere or corona. Our Sun is a bright source of X-rays. X-rays are also produced in distant galaxies or Quasars where it it thought that a very massive black hole (billion times more massive than our Sun) is accreting matter in the center. No X-rays from space can get through the Earth's atmosphere to the ground, so all X-ray astronomy is carried out with instruments on rockets or satellites. Where Do Gamma Rays Come From? Gamma Rays are caused by some of the most energetic events in the Universe. Gamma rays are often produced in regions of extremely high temperature. Gamma rays come from solar flares (eruptions on the sun's surface), pulsars (rotating objects which regularly emit radiation), nova and super nova explosions (explosions that cause stars to become extremely bright). Like X-rays, gamma rays are also caused by the falling of material onto black holes, a process known as accretion. The Compton Gamma Ray Observatory was launched by the Space Shuttle Atlantis of 1991 into a near Earth circular orbit. Did you notice that scientists use orbiting spacecraft and satellites to go above the atmosphere to collect data from the shorter light wavelengths such as gamma rays, X-Rays, ultraviolet and extreme ultraviolet? Take a look at this image to see how the atmosphere protects us from harmful radiation but limits the amount of information reaching astronomers.